A delicious meatless main or inventive side dish! While I created this recipe as a side dish, I’ve discovered we love it so much, it’s turned into one of our favourite meatless mains. Since quinoa’s gone mainstream in the Western world, you probably know that it’s a seed that is cooked like whole grains and it’s packed with protein plus all 9 essential amino acids, making it ideal for vegetarians and vegans, though omnivores love it too. One of the great things about quinoa is its versatility – you can enjoy it, as in this dish, warm or cold plus it cooks faster than other whole grains like brown rice or barley so you can whip up this tasty concoction in less time. You can even prepare the quinoa and roast the vegetables ahead of time and refrigerate, then warm slightly in the microwave (if you wish) and toss together with the apples and vinaigrette. Preheat oven to 400F while you prepare squash and onions. Put vegetables in a small metal baking pan and drizzle with oil; toss to coat evenly and sprinkle with salt and pepper. Roast for 20 – 25 minutes until squash is tender, tossing in pan once or twice during cooking time. While vegetables roast, bring quinoa and broth or water to a boil in a medium saucepan. Cover, reduce heat to a simmer and cook until quinoa is tender and liquid has been absorbed (about 18 – 20 minutes). 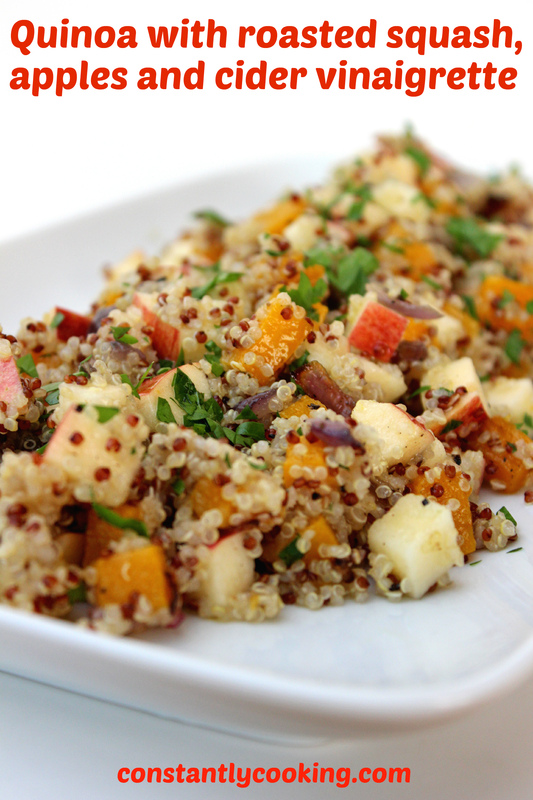 While quinoa cooks, prepare vinaigrette by whisking together everything but canola oil. Add canola oil in a slow stream, whisking continuously, so the dressing will emulsify (you can also use an immersion blender for this). Taste and adjust vinegar, salt or sugar to your liking. Transfer cooked quinoa to a medium sized bowl. Add roasted vegetables and chopped apples. Drizzle with half the vinaigrette to start and toss to blend well. Add more vinaigrette as needed until everything is nicely coated but not so much that you have a puddle of dressing in the bottom of the bowl. 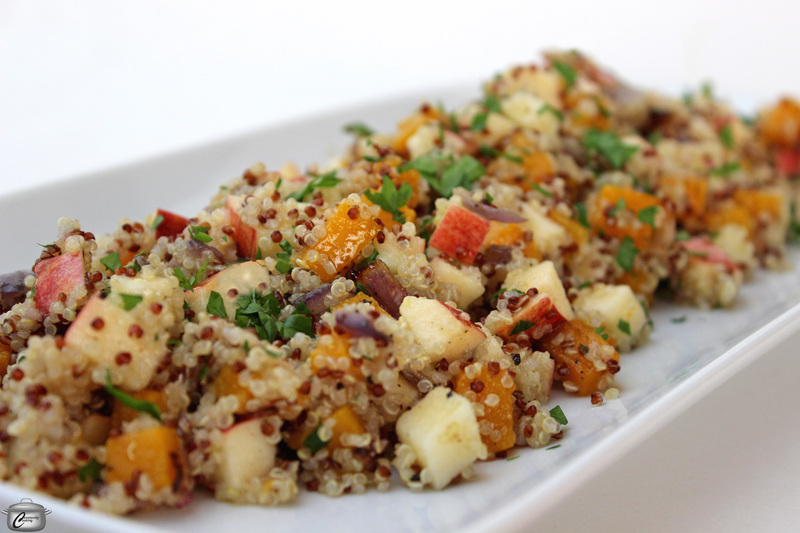 This entry was posted in Entertaining, family-friendly main dish, gluten-free, Grains, healthy, Make Ahead, make-ahead, vegan, vegetarian and tagged apple cider vinaigrette, apples, meatless main dish, onions, parsley, Paula Roy, quinoa, roasted squash, salad, side dish for turkey, side dish that vegans will enjoy, what to serve vegans. Bookmark the permalink.